In the late 1800’s, when shoes with gum rubber soles were invented, bad guys quickly adopted this new stealth technology to skulk about and, as a consequence, came to be known as "gumshoes." By 1908, however, the term had morphed into the name for the good guys in the silent footwear who chased the bad guys. Now Gumshoe refers to the FUNdraising detective walk held every summer in Seattle's Phinney Ridge and Greenwood neighborhoods. Since the event began in 2006, it has raised over $65,000 for local non-profits. This year, all Gumshoe proceeds will be shared by the Greenwood Senior Center, Greenwood Elementary School PTA and Phinney Ridge Lutheran Church Food Bank. To get a flavor for the Gumshoe, click here to see last year's clues and answers. Then lace up your sneakers, don your deerstalker, head to Ken's, the Phinney Center or Couth Buzzard Books, buy an entry form and and do this year's Gumshoe! Step 1: Get Gumshoe entry forms at one of these locations. They go on sale Friday, August 2. Debit or credit card, cash or check payable to "PNA"
A single entry form is $20, but if you cajole kids, friends, neighbors or innocent bystanders into joining you and buy two or more at the same time, forms are just $15 each. Step 2: Once you and your accomplices have your entry forms, head to Ken's—the Gumshoe's start and end point—and solve the 30 clues that lead you through the 5 kilometer walk. That’s roughly 3.1 miles of brain and body exercise, and discovering interesting things along the way. Do the Gumshoe in one day or over several—you’ve got 17 days, including three week-ends—to complete the walk. Experienced Gumshoes report that it takes about three hours. Should you buy an entry form and find you haven't done the Gumshoe for whatever reason—you were lost at the first clue, your walking partner bugged out on you, etc.—you can salvage your investment by doing the Procrastishoe! 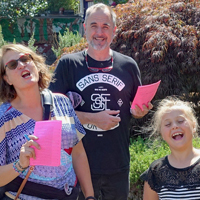 Join other last-minute Gumshoes at Ken’s at 3 pm Sunday, August 18, to collectively do the walk with the Gumshoe Answer Man following behind giving hints when you get stuck. You’ll be done in time to turn in your entry form before the event wraps at 6 pm. 100% of Gumshoe proceeds go to the senior center, PTA and food bank, and nobody is paid to help with the event. While the Gumshoe is a FUNdraiser, it's also about connecting people to the neighborhood and building community. It's amazing what you discover when you walk and pay attention, and the event wouldn't happen without some pretty amazing individual and business support! Want to know more? Email the Gumshoe Answer Man. © 2019—A GummedUp Production. For more information, contact the Gumshoe Answer Man.